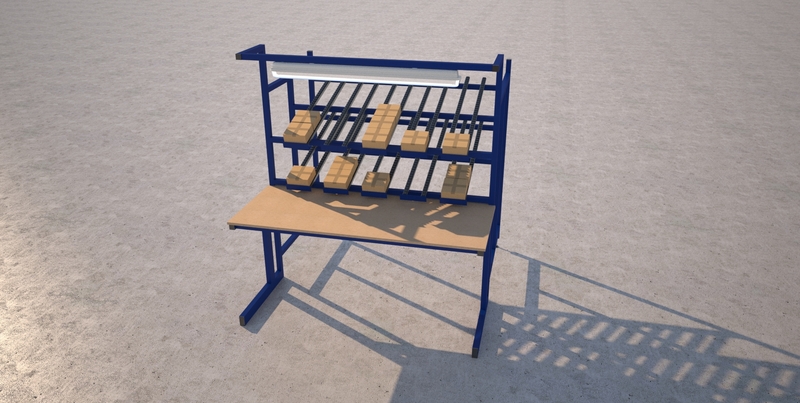 Spaceguard are an ideal partner to take your product assembly line concept in to workable balanced workstations. Transforming existing workplaces to improve productivity & ergonomics, reduce manual handling and improve product quality. The product assembly line shown uses a mixture 24V zero line pressure zoned accumulation roller conveyor to queue the product prior ball tables to easily manipulate the assembly into position on and off the workstations. Ensuring there is always product waiting to be assembled (driving the process time down), whilst giving the assembler time to thoroughly carry out there process. Well designed workstation make a huge difference in productivity. Having the tools and equipment to hand, presented to the assembler in an orderly way is vital to increasing productivity and improving product consistency. The addition of IT equipment and cabling within the workstation is a great way to keep track of process whilst improving the line ascetically. Along with additional overhead lighting tool rails. Reducing manual handling and additional product movement is a ideal way to reduce production costs. Adding testing and packing onto the assembly line an ideal in ensuring efficiency, so the assembly can go straight from the line straight to “Ready for despatch” ensuring the part doesn’t have to be handled again adding further cost. “Spaceguard packing stations improve packaging productivity”. Ensuring the assembler and packer have the correct stocks to enable to not slow the line is imperative to any process line. Inline parts storage or carton storage racking is ideal to keep productivity high. As a UK manufacturer, Spaceguard is the ideal partner to produce well engineered assembly, process and packing line which deliver productivity improvement, increased quality and consistency, reductions in manual handling along with ergonomic correct workstations reducing operator fatigue. Please contact our sales team to discuss your requirements.